Looking for private in-home or in-studio Broadway Singing lessons? Our El Dorado Hills teachers are ready to get you started. Find your teacher today! Check out some of our most popular teachers near El Dorado Hills, CA including Sacramento, Elk Grove, Roseville, Fair Oaks and West Sacramento. My pre-teen and teen students are singing and have sung leading roles in musical theater production at Harris Center, Elk Grove and Music Circus. In addition to the basics of how to produce a strong singing tone using belt, mixed and legit (head) voices, you will learn how to sing musically with meaning and drama. You will learn the key elements of various styles, including traditional, jazz, swing, pop, rock and folk style and how to incorporate them into your singing. I'll work with you to develop the strong chest, mixed and head voice, the abilities to sing loud and soft and to modulate from bright to mellow that you will need. To help you accomplish this, I will help you become very familiar with your physical instrument - how it functions and how to make it work safely, reliably and with good results. Your lessons are designed to help you develop the skills and confidence you need to successfully perform in public. I work hard to prepare your lessons and I ask my students to invest daily time working on skills studied at their lessons. Performing music requires the patient integration of multiple skills over time, however, the rewards are BIG. During your lessons you will receive instruction in skills needed to sing or play the cello as well as musical skills including rhythm, melody, harmony and style. Because there is a lot to learn, I encourage you to consider 45 or 60 minute lessons, which I offer at substantially reduced rates to make them more affordable for you. perform with minimal strain. Also, I incorporate internet resources in your lessons to keep them interesting and up to date. What will your lessons be like? At your first lesson we will explore and name the parts of your instrument (voice or cello). We'll talk about what you would like to learn, set attainable goals and select songs that you will be successful learning. In subsequent lessons you will warm up with scales and exercises, using common intervals with basic rhythms to improve your technical abilities and gain musical skills and knowledge, such as hearing pitches and intervals and keeping with the beat. This will also help you learn to read music. Singers will learn to use breathing to coordinate with your vocal folds to make a beautiful tone and sing on pitch, relax your throat and tongue to create resonant chambers, shape your mouth and tongue to color the tone, and use your tongue and lips to form the words. Cellists will learn to transfer your body weight into your cello to produce a mellow tone, placing your hands and arms on the cello and bow in a relaxed and balanced manner to allow you to play smoothly and in tune and to prepare you to produce a lovely vibrato. Since cellos don't have frets, you will also learn to locate each note on the cello but just a few notes at a time - until you know them all. You will learn to use your technical skills and knowledge to create musical phrases that sound beautiful and authentic and are fun to perform and listen to. You will need to practice simple skills and phrases repeatedly until they become habit. I will lend you my kind and patient support to help you through the bumps in the road. Not sure how to practice at home? To support your practice at home you will: Receive a recording of each of your lessons to practice with; Learn simple exercises you can do at home; Learn to create and use simple backup tracks of your songs to learn to hear rhythm and harmony; Learn how to use your computer at home to get feedback for pitch, and tone quality. When you are comfortable I will provide opportunities to perform in student programs performing for friends and families. You will have opportunities to participate and perform in workshops which include performance opportunities, lectures, demonstrations and Master Classes with nationally recognized teachers and performers. I received about 10 lessons from JoAnn and feel very good with the results. I started playing guitar and singing in a small band and knew that I needed help. Joann educated me with many warm up lessons, a good start on reading music, and numerous exercises towards reaching pitch that will also save my vocal chords from harm. It's up to me to practice and use the available tools that JoAnn has introduced me to while I take a break from lessons while traveling. JoAnn is a professional singing teacher. She is great! My daughter really enjoys her lessons and we appreciate how thorough JoAnn is. JoAnn is a very patient and kind teacher. In the last few lessons I've had, she has taught me more than Ive learned with my previous teacher of 8 years. She is very understanding and teaches her students everything we need to know to be a good vocalist. I would highly recommend her. Learn how to sing and perform in the musical theater style! I was a profession show singer for many years and performed in Cabarets, and National theater Companies throughout the Midwest , New York and San Francisco, I specialize in Broadway Singing doing several Musicals by Stephen Sondheim and Leonard Berstein as well as original material written for me by my musical arranger. Ever since starting to do music theatre in Sacramento, I've really made a splash! I know a lot of the directors in Sacramento and the kind of sound they are looking for. I can teach you to low larynx belt just like the pros: Idina Menzel, Jeremy Jordan, etc. Broadway singing is a great dream career for many! Get started training the best way to have a natural tone and strong voice. Learn how to turn your notes instead of pushing them out. 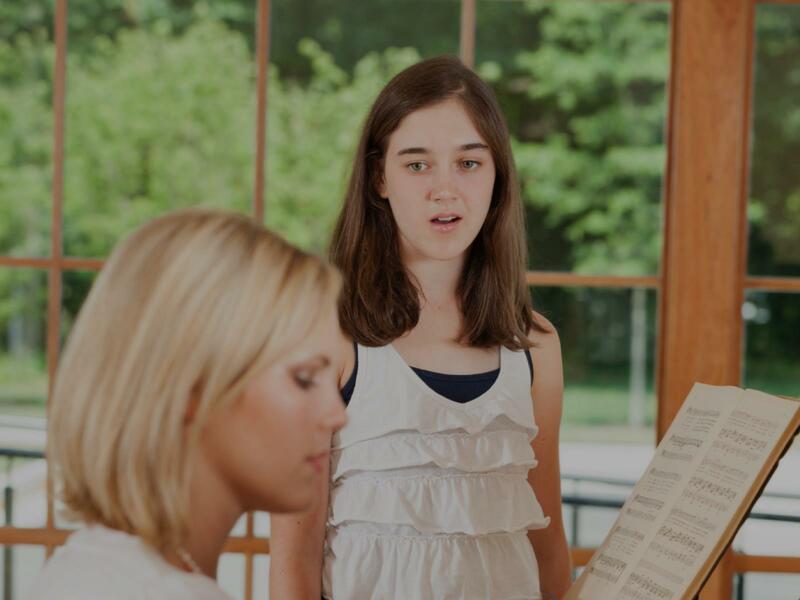 Students can expect help with healthy singing technique suitable for Broadway-style singing, as well as learning performance practices and audition techniques (if applicable). As a piano and voice instructor, I have taught individual lessons for the past 13 years to students from 5 to 85, beginners to advanced students. I hold Master of Fine Arts degrees in both Collaborative Piano Performance and Vocal Performance from Notre Dame de Namur University. In addition to my private students, I am the vocal coach and accompanist for the Sacramento City College Music Department, accompanist for the Sacramento Children's Chorus, and accompanist and vocalist with professional women's ensemble Vox Musica. I also am co-founder and artistic director of the Empire Arts Collective Pop Choir. Lessons are taught at the Sacramento Preparatory Music Academy. Please note that while piano lessons are offered for students as young as 5, voice lessons are not offered until students are at least 13. Song Delivery and interpretation.Vocal projection. Range expansion. Breath Control. Can't find a teacher in El Dorado Hills, CA? to properly sing. She is friendly and always tailors her lessons to the individual needs of the student!"